I first bought Poser 3 in 1998. One of the employees at a company in NYC, where I was working freelance had a copy. I decided to try it out. Today I use Poser as one of my main tools for making still images for print. I primarily use it for posing a figure. The first time I used Poser was to pose a figure and select a camera angle so I could use the render as a reference for a 2D illustration. It quickly gave me proper proportions and action to make my 2D illustration more realistic. It’s always cool what you can easily create with Poser. I figured that in time the figures would become more believable. Today, the figures are almost photoreal. Sometimes, you have to look at the illustration twice to see if it's real or not. Skin textures are great and the figures available through Content Paradise, Renderosity and others are proportionately elegant, even up close. 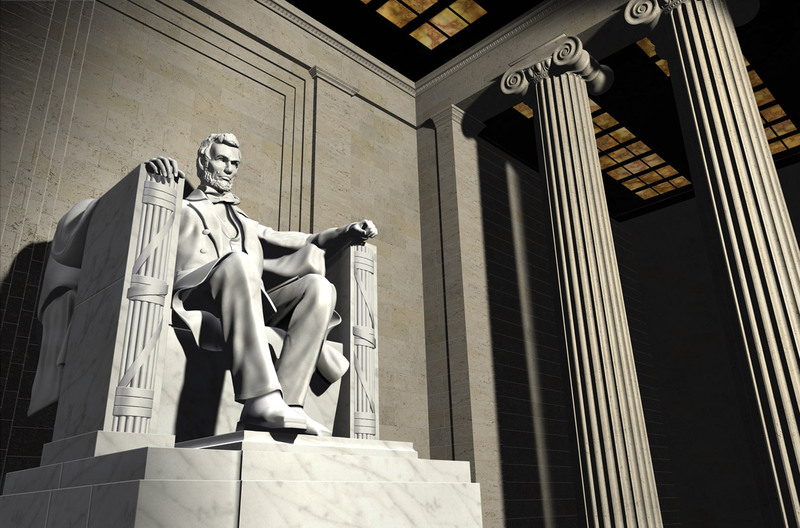 The statue of Lincoln in the Lincoln Memorial: seated, rising, walking, and preparing to leave. This started by morphing a generic Michael 3 figure. "Life of the Party" was done as a sample to show clients how far Poser figures had been improved and what a range of figures could be made from just 2 Poser figures (Victoria 4 and Michael 4) with morphing and different skin textures. Fungi Man was created morphing a Michael 4 figure into a man in his 50's or 60's who is slightly overweight, with a receding hairline. The models of the 3 kinds of fungi were modeled in Hexagon. Everything was brought into Vue and back lit with warm yellow light. 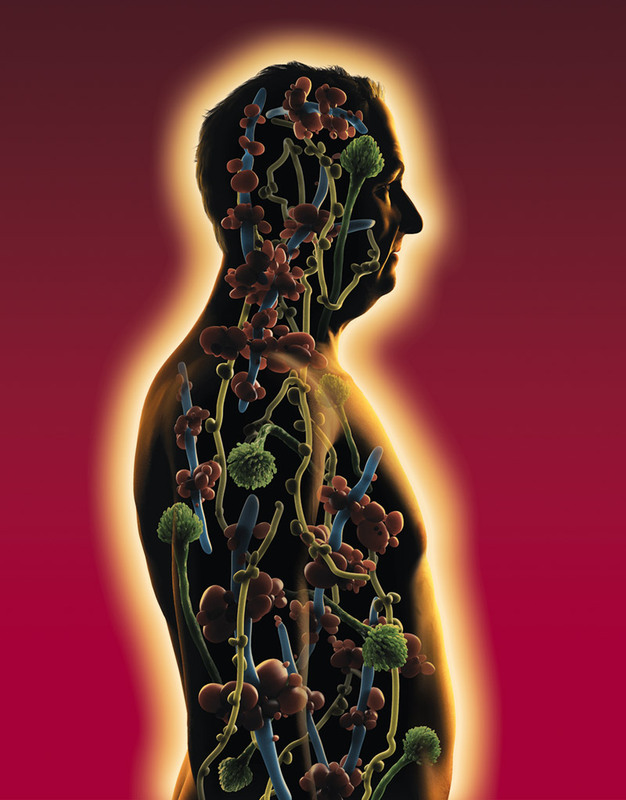 The man and non-overlapping groupings of fungi were rendered separately and then placed on separate layers so that if the client wanted to make any positioning changes it could be done easily. 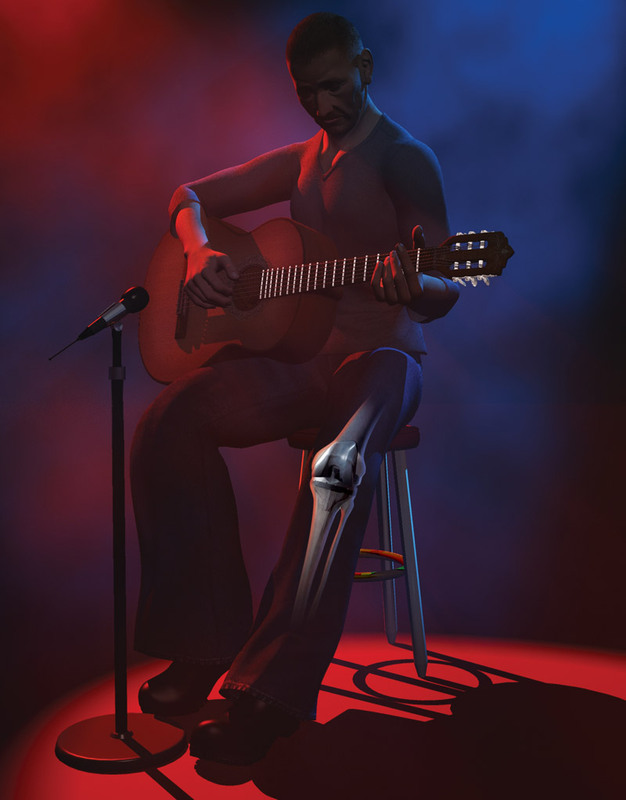 Guitar Player was an illustration for a concept for medical advertising of a knee replacement device. Here, Michael 4 is morphed into a middle aged man. I like how the lighting subdues everything except the frets, tuning keys and the knee replacement. Thirty-three 3D dinosaur illustrations for the Discovery Channel's "My First Dinosaur Encyclopedia." This was a big production with a tight deadline (3.5 months). Most of the Poser dinosaurs were created by Raul Luna (Dinoraul). 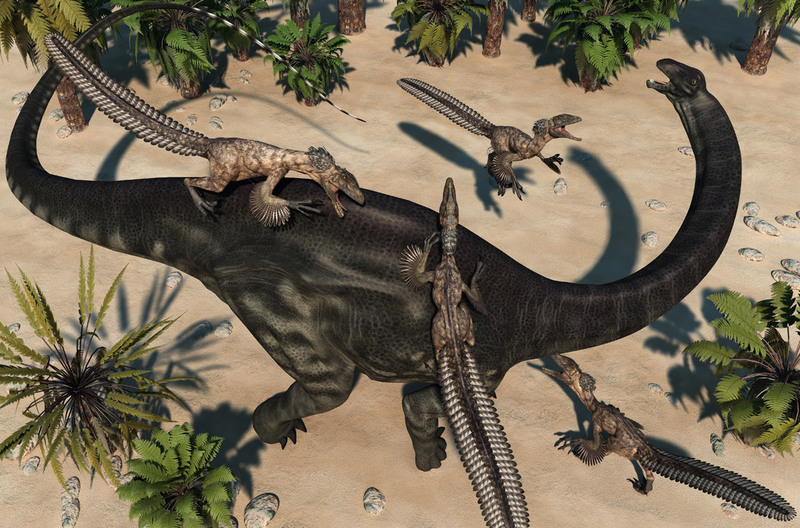 I posed the dinosaurs in Poser and imported them into Vue. 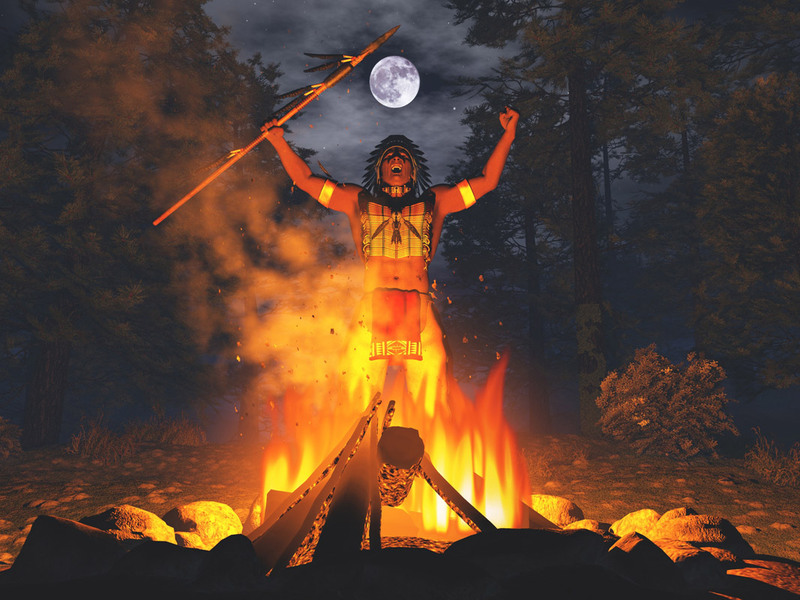 Declaration of War uses a morphed Michael 4 character (Falcon) as well as various other Poser wardrobe and props including the campfire logs and stones. All of the aforementioned projects were jobs for clients. I had a lot of freedom of composition for the Lincoln Memorial and the dinosaurs because there were no layouts, just descriptions of the scenes. Life of the Party was an ode to Reid Miles photography, which was very popular in the 80's. Declaration of War was an experiment in lighting. I enjoy the ease of morphing a characters age and weight. Additionally, I like controlling facial expressions beyond the presets. I currently have 3 books that I've started writing, one of which is a fiction book that I'm illustrating in 3D using Poser. Hopefully I can finish all of them someday. I don't consider myself a Poser expert. I'm mostly self-taught in all the 3D programs I use. Every assignment I get is a new challenge with new requirements, so I learn something fresh about the various programs with each assignment. In Poser, I only recently started getting into building bone structures in figures as I didn’t need to do previously. I'm also starting to create morphs in Z-Brush and bringing them back into Poser. I guess that's why I remain enthusiastic after all these years, I'm always learning something new. My strengths as an illustrator are a result of many years as an art director and associate creative director on the East Coast. My strong suits are composition, color, lighting, and production organization. My key to making Poser figures look realistic is trying to create a personality in them. I don't care if it's a Poser figure or a photo of a real person, without showing personality they look like mannequins. 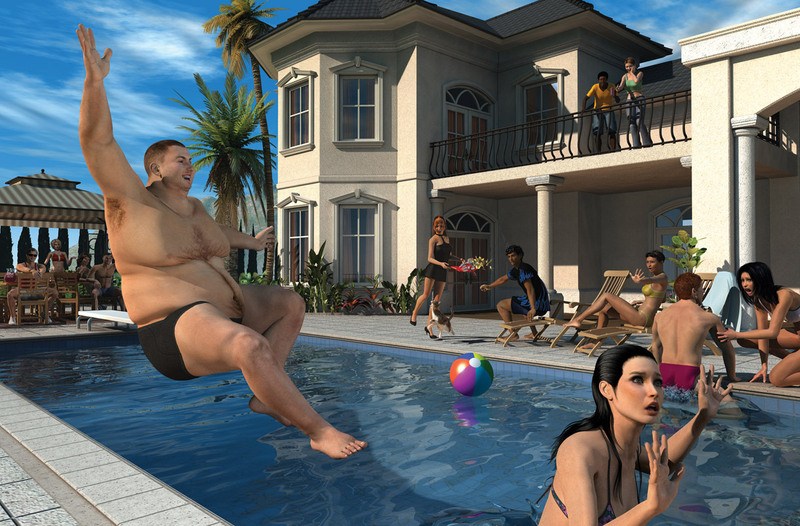 Other important factors for realistic Poser characters are believable action, facial expression, eye contact, and lighting for starters, then having clothes fit and flow properly as if affected by gravity. Basically it's caring about every detail.